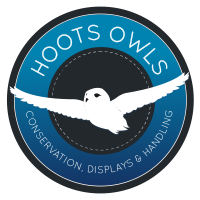 Come down and visit Hoots Owls at Hoots Hollows, our visitor centre, where you will be able to meet, touch and even hold a wide selection of our owls from across the world. We're open everyday Monday to Saturday (closed on Sundays), unless there is an event to which we are going. You can keep up-to-date with all the news and events on our website or by emailing us, and also catch up on any new arrivals we have. Please get in contact with us or see us at one of the many shows and events we attend to find out more!